Few things are more comforting than a piping hot beverage on a brisk day. With Swiss Miss hot chocolate mix with marshmallows, you can bring your patrons that warmth and satisfaction any time. Made with the utmost care, Swiss Miss products are created from only the best ingredients, blending the freshness of locally farmed milk and the decadence of premium imported cocoa. Packed with a rich chocolate flavor, a smooth, frothy texture, and finally topped off with dried mini marshmallows, this mix will create the perfect cup of cocoa for any cozy moment. The convenient packets are an ideal addition to cafes and restaurants, as well as for use in offices, waiting rooms, or as hotel room amenities. Swiss Miss is a well-known brand for hot chocolate and the mini marshmallows make it even richer and creamier. The little packets are the perfect portion size. They'll look great on a breadfast buffet or on your own table at home. You can't go wrong with Swiss Miss. My family likes this product. We have tried many different brands. It is as good as the more expensive brands out there and perfect for breakfast. I'm keeping buying this brand. The taste is rich and flavourful and has become # 1 for us. I would definitely recommend these to other shoppers. I like how many packs of hot chocolate you receive for the price, the hot chocolate tastes great. I like the added marshmellows as they give more flavor then the regular hot chocolate products. I've been drinking Swiss Miss Hot Chocolate since I was a little kid. It has by far the best chocolate taste of any other brand. The marshmallows are an added bonus! Kids love this chocolate mix with or without mellow, WS recently removed it from PLUS or we'd still be buying here, but shipping made it too expensive. We order Swiss Miss primarily for one of our autistic, adult employees. This is her favorite hot chocolate. The pouches are great because it keeps the powder fresh. Also, there's the perfect amount of powder in each pouch for a 8 oz cup. Swiss miss is the master of hot cocoa! You can never go wrong with any Swiss miss product. The one is my preference because it has the mini marshmallows! Hot chocolate packets are great when you have a lot of people to serve and you need to do it fast. I highly recommend these to anyone needing great tasting hot chocolate. This Swiss Miss Hot Chocolate Mix with Marshmallows is very tasty. Convenient packaging. All the members of my family liked it. I will recommend to friends! I bought these for my kids and they love it! It is such a good price for how many you get. It is much cheaper than grocery stores. Who doesn't love marshmallows in their hot cocoa ? With a name like Swiss miss, you know you're getting quality. Not to mention a great way to warm up in the morning if you're not a caffeine person. We LOVE swiss miss hot chocolate, especially during the winter months. It tastes great, and is really convenient in these packets. This large box is a great value too! Swiss Miss Hot Chocolate Mix with Marshmallows - 50/Box Great to just mix in hot water and mix. I love this brand of hot coco. Great product, Swiss Miss is the best by far! Packaging is easy to manage and open, display option is great for those kids always diving into it. Will buy again! Swiss Miss is a classic hot chocolate brand, and I love it for nostalgia's sake. Careful, though—this one has those weird little mini marshmallows in it, which caught me by surprise. I think I prefer the plain! A super easy hot cocoa mix to make and the added marshmallow are great. Great for single serve parties and displays well on our drink stand. 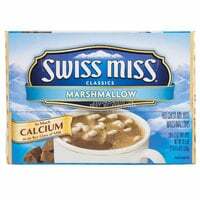 This Swiss miss hot chocolate mix with marshmallows is very good and is sold at a good price. You can also get more discounts when you buy more boxes. Came in a resealable box which made it really nice for storage. Tastes great and a great value for the price. Shipping was really quick. This is hot chocolate has a nice flavor, and the welcome addition of some mini marshmallows. I like the individually portioned packets which allows you to make a cup whenever you want to. These packets are very economical at around 12 cents each. Swiss miss hot chocolate mix with marshmallows. There are 50 packets in the box. That is a lot of hot coco! The kids love it and so do I! We just love this hot cocoa with marshmallows. Easy to make with either water or milk, this is perfect for home or the workplace. great value! 50 packet box is a great deal for hot cocoa. Swiss Miss has always been a trusted brand to me and I have never had any complaints about this cocoa! The individual packets make distribution easy and help prevent contamination of a larger package. A delicious style cocoa with added dehydrated marshmallow for an extra special treat. Easy to mix and simply add hot water. The packets are convenient and great for our snack stand. My son loves hot chocolate in the winter time. This one is his favorite, and it is priced well so I stock up all the time! This box of 50 hot cocoa packets is a great deal. Each packet makes a cup of yummy cocoa simply by adding hot water or milk. Swiss Miss hot cocoa mix is a great treat for any time of year. This mix comes 50 packets per box and has yummy marshmallows too. Easy to make, simply add hot water or milk. The mini marshmallows in this hot chocolate make this what it is for me. I could eat boat loads of them by themselves they are so good. A true classic hot chocolate mix that has become a favorite of all. The Swiss Miss hot chocolate mix with marshmallows creates a yummy and decadent cup of hot cocoa. What could possibly make hot chcolate better? Freeze dried marshmallows of course! I love these so much and the marshmallow addition makes this version fun to drink. This is some good hot chocolate! It's nice if you don't want something thats super rich in chocolate flavor like the Ghiradeli hot chocolate. I love drinking it while watching movies! I really enjoy this hot chocolate once it's dissolved and the marshmallows have melted. They add a nice sweetness and creaminess to the hot chocolate which I love. This Swiss miss hot chocolate is even better than the original version because of the marshmallows. Since they're freeze dried they're kind of crunchy but I like that. They melt once liquid is added. Swiss Miss Hot Chocolate with Marshmallows is a favorite in our house. The tiny marshmallows make a great sweet layer on top of the hot chocolate. This is a great product. Very tasty when just made with water and rich and creamy when it's made with milk. I love buying this in bulk and especially with marshmallows as the grocery store at which I shop no longer carries this item. Swiss Miss is by far the leader in hot chocolate. There is no comparison. It has always been my go to drink in the cold months to warm up. Delicious hot chocolate especially for the kids who will not drink it without the marshmallows! Creamy rich chocolatey taste from the undeniable leader in instant hot chocolate! I’ve tried other brands of hot chocolate before and I just think Swiss Miss makes the best packet version. The flavor is best with milk even though it can be made with just water. I love that it comes in this huge box. I save money buying in bulk…the 8 packets or so that come in the grocery store box are never enough. Swiss Miss is a brand favorite for hot cocoa, or as my niece calls it, "Christmas Cocoa." The tiny marshmallows melt in your mouth and Swiss Miss has a nice chocolate taste that is mellow and comforting. For a 50 count box, this is a super price. This is a great price for this brand name hot chocolate. 50 individual packages come in the box. The outside box can be used to display the packages inside. Tastes great and a price price. My children love this hot chocolate. It has a nice creamy taste and mixes very easily when added to hot water. We really enjoy the little marshmallows in it and will be buying this again! I love Swiss Miss hot chocolate mix with marshmallows because it is unlike any other hot chocolate mix. It is sweet but not too sweet with subtle undertones of cocoa. This is a good value box because of the quantity and the price. The quality cannot be missed because is a true and trusted brand in hot chocolate drinks. We love it! No need to add more marshmallows because the company already has. Okay, so more could be added because hot cocoa can't have too many marshmallows. This is a good product from a well known and trusted company. Yummy yummy! You can't go wrong with good ole' swiss miss. This is such a great price for a 50 pack. I buy these to have on stock in my classroom! Yes it is Swiss Miss with marshmallows. Fresh. Our employee's loved it and we enjoyed getting it at a good price compared to local stores. This Swiss miss hot cocoa is easy to mix and very rich! I love adding a couple more marshmallows and enjoying it on chilly nights! Hot chocolate is always delicious. This brand swiss is always a favorite among our customers. The marshmallows are quite small though so you might need to add your own. I used this item for wedding favors to my guest. They absolutely loved this. I like the quality of the product and the price. There were no other stores that could offer this product at the same price! I will continue to use this company!! You can't go wrong with a classic, these individually wrapped pouches contain delicious hot chocolate and complement our tea and coffee service nicely in the conference room and coffee bar. This is a great value for the money. It's a great, well known brand that customers love, with great flavor. It's the perfect amount of packages for food service. There is enough for you, and for you to share over a long winter. There's a lovely sweetness to this brand, and not just because the heat of the liquid you pour in is more or less guaranteed to melt the marshmallows. A classic favorite that everyone loves, especially the little marshmallows that float up to the top! The large box comes in handy to keep enough in storage. Fast to prep with just hot water. I really like it because it only have a few little seeds of marshmallows (about 15 little ones). The price is incredibly cheap. Those who like more marshmallows like my children have to add a lot more. My children go through them pretty quickly, e.g., tastes good and convenient in small packages. Strongly recommend it. I love having Hot Chocolate around for my customers and employees. Purchasing from here I get it for 50% less then anywhere else. Who doesn't know and love Swiss Miss Hot Chocolate with Marshmallows? It's known well enough that if people have kids with allergies they already know if their kid can have it. This is a must during winter. I was so excited to receive this hot chocolate! We will be serving it at our fall wedding and cannot wait for our guests to drink it! The tiny marshmallows are always a hit with kids. This is the definitive hot chocolate mix and always is delicious. Mixed with warm milk it is incredibly rich, smooth, and satisfying. This is a good quality instant hot chocolate mix and you got to love the minnie marshmallows. This is an extremely affordable product thanks to Webstaurant. Yay for Hot chocolate.! Mixes so well with warm milk and hot water, We use a lot of this in MT to keep warm this is a very large package and well worth the price. Cheaper then buying it at the food store. This is a hit, everybody loves the tiny dehydrated marshmallows. It's a little too sweet, but you know what you're getting into here. Great price also. Swiss Miss Hot Chocolate Mix with Marshmallows is our favorite hot chocolate mix. We drink it all year round it's a nice rich tasty hot chocolate.